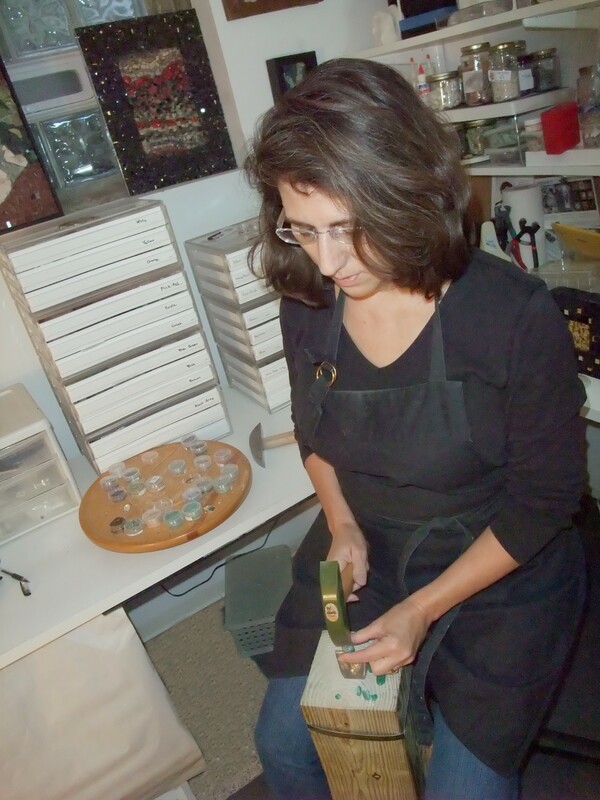 I began studying mosaics in 1999, reentering the art world when my youngest daughter went off to kindergarten. Having previously worked in collage, textiles, pottery and beading, all tactile in nature, I saw mosaics as a never-ending opportunity to explore texture and work with materials in different ways. I originally worked with stained glass, ceramics, and other manmade materials, but over the years my choice in materials and the style of my work have become organic. Inspired by the beauty and abstractness in nature, I use a wide array of gemstones and minerals to create a sense of softness and fluidity. I began creating micro mosaic jewelry to expand the reach of my art and to challenge myself to work on a very small scale. My style has evolved into the creation of wearable landscapes, with minerals and pearls becoming sunrises and sunsets over oceans, mountains and cities. Through the use of color and texture I seek to bring a sense of calm and peace to both the wearer and the viewer. I have studied mosaics with international artists including Verdiano Marzi, Sophie Drouin, Ilana Shafir, Maggie Howarth, Matteo Randi, Sonia King and Karen Ami. I previously served as Director of Development and taught at The Chicago Mosaic School and assisted in a number of public art projects. Currently, I teach beginner through advanced mosaic art at The Art Center of Highland Park. My work has been exhibited nationally and is held in several private collections. I teach mosaics to nurture exploration, guide energy, and to share both the challenge and enjoyment of creating mosaic art. I encourage my students to look at everyday objects in a different way, and to use color, texture, and light to enhance their designs.